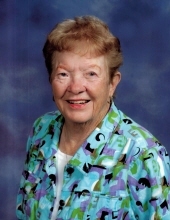 Patricia (Pat) McManus passed away on December 4, 2018. A visitation will be from 4:00 PM – 7:00 PM on Friday, December 7, 2018 with a rosary at 7:00 PM at Caldwell Parrish Funeral Home & Crematory in Urbandale. A Mass of Christian Burial will be at 11:30 AM on Saturday, December 8, 2018 at St. Theresa Catholic Church in Des Moines. Burial will be at 11:00 AM on Monday December 10, 2018 at Mt. Olivet Catholic Cemetery in Raytown, Missouri. Pat was born in Kansas City, Missouri to George and Marguerite Bagby on February 8, 1930. She attended St. Francis Elementary School, Bishop Hogan High School and Junior College. Pat and John were married in May of 1950 a St. Theresa Church in Kansas City, Missouri and together they raised two children. The family resided in Kansas City until 1963 when John was transferred to Des Moines with the Hershey Chocolate Company, as a district manager. Pat was employed at the United Parcel Service until she began her real estate career in 1978, and retired in July of 2014 from Iowa Realty. She enjoyed helping clients with their real estate needs, and was still in touch with many of them. Pat had a great love of life, appreciating every day as a treasure. Her volunteer activities included St. Joseph Emergency Family Shelter, Catholic Charities and Eucharistic Minister to Catholic Patients at Lutheran Hospital. She enjoyed card games, gardening, golf, coffee with friends, and holidays. Pat is survived by her daughter; Mary Kay (Richard) Brinkman and son; Lawrence (Lori) McManus, eight grandchildren; Sarah, Daniel, Logan, Sydney, Allison, Sheryl, Suzie and Jeff. Five great grandchildren; Robbie, Ryan, William,Anouk, and Claire. Nieces and nephews; Pat Garry, Kathy Lehe, Denise Lucas, Sharon Henry, Candace Mills, John McMahon, Tim Slauter and Mark Slauter. Pat was preceded in death by her husband John in 1986, her parents; George and Maurerite Bagby, sister and brother in law; Rosemary and John McMahon. In lieu of flowers, memorials may be made to the St. Theresa Church or St. Joseph Emergency Shelter. To send flowers or a remembrance gift to the family of Patricia McManus, please visit our Tribute Store. "Email Address" would like to share the life celebration of Patricia McManus. Click on the "link" to go to share a favorite memory or leave a condolence message for the family.